I have to make an admission. I am known far and wide as a Type A personality. I prefer to think of myself as a recovering Type A. You can say that I am fairly wired by nature, and this review seems sort of serendipitous in a way. I also have another confession to make. I have been highly suspect for some time about the claims of certain cable makers. I have never doubted that improvement in sound can be had by upgrading cables. All one needs to do is take a cable such as the Monster zip cable and go to a base line XLO. There will be a significant, if not downright astonishing difference. Same if you go from a Kimber PBJ to a Hero interconnect. That being said, I have always been of the opinion that the law of diminishing returns begins to apply around $500-1000 in any piece of wire. Cables beyond that has always been suspect in my mind. By way of comparison I am an avid cyclist. I happen to ride a beautiful Calfee carbon fiber bike with top line Campagnolo components. Think top line amplifier, killer turntable/cartridge and top line speakers rolled into a two-wheeled machine. All in a beautiful candy-and-pearl fade to clear coated carbon paint job. A DaVinci turntable with a Koetsu Jade cartridge feel. The bike will set you back the way I have it equipped about $7500-8000. It is on the level of the bike Lance Armstrong rides when he is assassinating the field of the Tour de France and offending the nation by obliterating their prize race. These bikes are steeply priced and it is all about weight. The less the better. Here is the connection. I can build a bike that will come in at a weight within 16 ounces of a top flight racing bike for $3500. The extra 16 ounces cost $312.50 per ounce to shed from the parts on a bike. You could trim five pounds off the engine by not eating so much for two weeks and not pay a thing. Heck you might even save the price of a few cheeseburgers and beers. And yet all cyclists make it an art form to buy those trinkets for bragging rights as much as for the benefit of the weight loss to the bike. Until a few months ago I thought that number was about one fourth of what it is now, thanks to XLO and the Signature-3 series of cables. Aside from the speaker cables, the rest of the Signature Series falls almost midway in the XLO cable line. 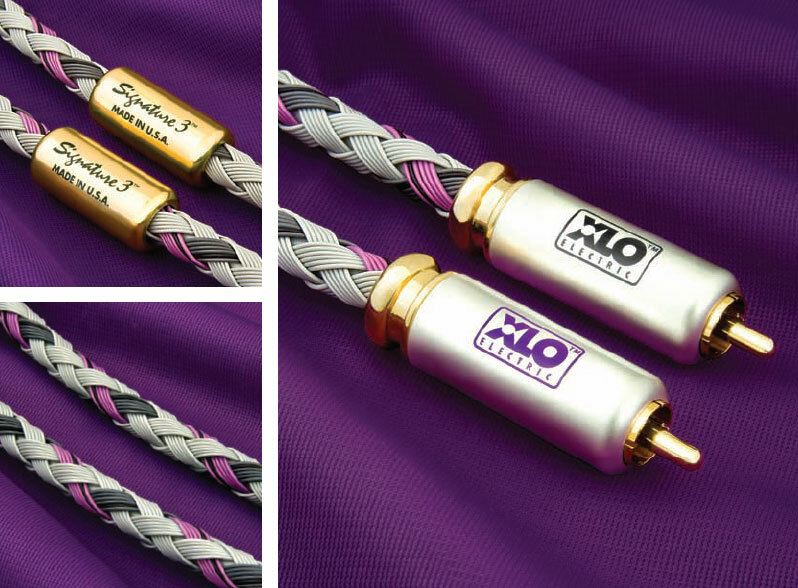 The speaker cables, at least at this time, are the top speaker cables XLO is offering. When Jonathan Scull approached me about reviewing these cables I was not aware of the pricing. I enthusiastically said yes. I had always been aware of XLO since jumping back into this hobby full force 20 years ago. I was always intrigued with, among other things, their choices of colors and the combinations they used, and to this day they still pick some interesting combinations. When you say them, they don’t sound right – Purple, Green and White intertwined. Much like I thought when my 21-year-old daughter Rachel asked if we would paint her room in our new house Deep Brown and Hot Pink. I thought I would throw up. Guess what? It works! Same with the XLOs. Great minds think alike I guess. The new Signature-3 series has a more muted look but they are Purple and Gray and extremely attractive looking draped in my system. Advice to those who make the decisions at XLO – keep the funky color combinations. They add a great deal of visual character to the cables. Upon arrival of the two boxes I eagerly opened the smaller of the two. The cables were already partially burned in and ready to go. Inside a very attractive wooden case was a 6-foot Signature-3 power cord. The packaging is extremely nice. I then opened the much larger box and got the “reviewer” packaging, Glad zip bags. Oh well you don’t listen to the boxes anyway and they take up space, invite comments and opportunities to brag. You know, the stuff that audiophiles never engage in. As I tore through the bags (actually I very carefully opened the exquisite polyethylene protective packaging, J10) and grabbed the cables, I was immediately taken by the feel. It is apparent from the touch of the difference between a suit cut from wool or silk and polyester blends and one cut from the finest silk or wool. The way a fine watch like an Ulysse Nardin (I own two of them) is easy to distinguish as a far superior watch to a Seiko. Same sensation with the XLOs. These are Ulysse Nardin to some other manufacturers’ Seiko. Both are quality but one is a luxury brand and it is not Seiko. I began to cover myself in all these different cords and dance around the room spinning…… (Did I just say that out loud?) As I was saying, I began to systematically and rather boringly lay out the cables in a logical, discernable and very manly fashion. Once I had everything sorted out I began to insert them into my system in replacement of my Kimber Kable Monocle XL speaker cables and Select interconnects. I then sat back and fired up the system just to start them settling in. At that moment I stumbled across the invoice. When I came to, the music was wafting through the room and I immediately had an understanding of the price that had just made me faint. The notion of investing some $15,000 on what is essentially a bunch of wires is something I would have scoffed at and called absurd. $15,000 can put you in one hell of a starter system and here I was playing with that much just in a bunch of wires, albeit very cool looking and fabulously sounding cables. So the question became, “Can I really justify the expense of these eclectic looking bits of wire?” Of course I said this to myself and immediately myself shot back this answer, “Of course you can you moron, the real question is can you justify that to Paula?” I hate it when my various inner selves start their little battles like this. Generally speaking, the next thing that happens is Gary gets into a lot of trouble. At any rate there is no doubt in my mind that the cost of the XLO cables is well worth it. There you go. That’s it. Review done! Great cables! Buy Them! Ok so you want a bit more information. Well, for those of you who simply cannot take things on faith and are more finicky, here is why I say buy them. New Integrated Field™ winding geometry with revolutionary Wavelink™ signal transmission technology. Proprietarily treated UPOCC-6N (Ultra-Pure, Ohno Continuous Cast 6-Nines) Laboratory Grade copper conductors. Ultra-low capacitance, Teflon® dielectric insulation. Terminated with XLO’s exclusive, precision machined, low self-inductance Teflon® insulated RCA connectors with 24K mil-spec gold-plated contacts. XLO™ cable identification ring with serial number for cable directionality and authenticity. Proprietarily treated UPOCC-6N (99.99998% pure, Ohno Continuous Cast) Laboratory Grade conductor. DuPont® Teflon® variant cores and dielectric insulation used throughout. Terminated with XLO’s direct gold-plated 6mm or 8mm spades, or bananas. 14 AWG, 6N (99.99998% pure) UPOCC-6N, individually insulated copper conductors with XLO’s original two proprietary treatments plus multi-step high intensity degaussing and full cryogenic treatment to regularize cable and connector molecular structure for improved performance. Exclusive bi-metallic double-shielded and double-grounded construction for broader bandwidth EMI and RFI rejection. Terminated as standard with XLO™ proprietary 15A/125 VAC NEMA AC plugs and IEC connectors featuring OCC copper contacts and precision machined and anodized non-conductive aluminum alloy connector shells. XLO™ cable identification ring with serial number for cable authenticity. Sadly, I am not an electrical engineer so when I read through some of the jargon used by manufacturers I become a bit disoriented and confused. So, I immediately try to translate into layman’s English what I just read. Here the important bit of info is the LAB grade of copper. This is the same grade of wiring used in space vehicles, surgical machinery. Proprietary applications, where you want the absolute best and you do not want any chance of signal degradation as it is transmitted through the wires, is what this wire is for. As for the uniqueness of XLO and the sound? Well………. First off, these cables come as close as I have heard to basically being no cable at all. In other words they do not add any coloration of their own. I did not realize how much my other cables did add to the sound until listening at great length to the XLO Signature-3. While these are not the top tier of XLO, I cannot imagine it getting a whole lot better as far as neutrality in delivery. The XLO Signature-3 can reproduce sizeable sound staging. It couples this with a significant improvement over my previous setup in the area of image focus. The cable combination allowed me to see the music and not focus on the equipment. For those of us with Type A personalities it is very hard for others to be around us at times because we are always buzzing with pent up energy and we are constantly looking for ways to unload it. It was almost the same with my system when I installed the Signature-3 compliment into it. Suddenly, it was as if my system was the Type A and suddenly found a wonderful outlet for all this pent up energy. The Signature-3 has a great deal of speed in its delivery almost as if there is a direct connection between source, preamp, amp and the speakers. One thing is for sure: Whatever you input, the Signature-3 will output the exact same thing without coloration and it will do it with incredible rhythm and pace! The Signature-3s have made a significant improvement in my system. I have taken out the cables numerous times to put in other cables, some for review and some just for the sake of keeping things honest. Every time I notice the difference and each and every time I find myself going back to the XLOs and enjoying the impact on my system and my personal enjoyment of it. Any defects of faults? Yep there sure are. The speaker cables and the power chords are stiff and unweilding. I have the sense that this will always be, as I do not see anything shy of working them over on some kind of loosening machine for a few weeks before there will be changes to this aspect. That being said, XLO is not alone. Many of the better cabling gets this way as a result of build complexity and materials selected. They are not, however, unmanageable. You can twist and turn them to a degree but they will always afford some level of resistance to being bent to your will. All in all that is the only weakness I have found with the XLOs. Everything else is first rate. Sound, construction and presentation are all top tier. I m using a borrowed xlo signature3 speaker cable. I m really happy with it natural large soundstage very palpable imaging yet musical. The problem now where can I order one. The local Philippine dealer is saying the xlo usa is not responding to his order. Please help me on this matter.thank you,. Watch out for the Asian fakes on E-bay!